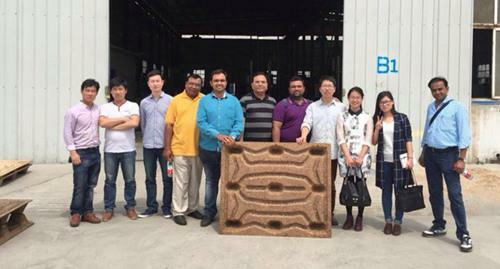 On 14th April, 2016, Manish and his colleagues from India came to our factory to test wood pallet pressing machine and wood crusher machine. Manish has bought four sets of old frame structure press machine from another company, which are more than three years ago. And he has a lot of stable customers in his local market. So there is a huge demand for compressed wood pallet machine. There are problems came out for the frame structure pressing machine, like guide instability in process of pressing, inaccurate pressing of the upper mold and lower mold and deformation of framework. So they are now looking for better ways to solve these problems. Then they came to see our wood pallet moulding machine. The pressure of pallet machine they want is 1600 t. So we will customize the machine size and pressure, and the figure of the mould according to customer’s requirement. In addition, ThoYu wood pallet moulding machine adopts 3-beam 4- column structure with good strength, rigidity and precision retaining ability. And the four-column guide device assures the precision of closing moulds and the stability of pressing during the working of press machine.